Spring makes me so happy. Well, spring before the Florida humidity peaks at 100% and I look like Monica in that hysterical Friends vacation episode. Crazy hair aside, spring style means fun colors, cute purses, easy sandals and effortless denim, cute ruffles and pretty bow details. Sign me up. For your spring style planning, check out everything here. 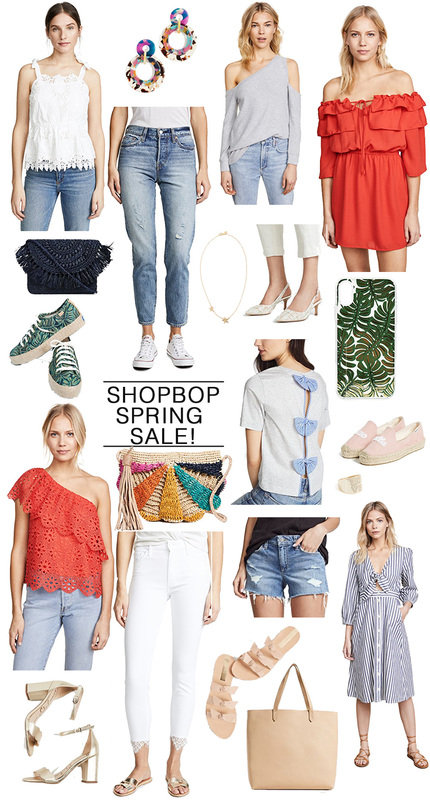 Best of all… it’s ALL currently on sale, up to 25% off, part of the Shopbop Spring sale. The sale runs April 10-14, and you get 20% off orders under $500, and 25 percent off on orders of $500 or more, with code EVENT18 at checkout. I’ve learned that I have friends who are either obsessed with the site (myself included, free shipping on any item & such a good selection!) or friends who have never heard of it. It’s become very mainstream, even offering Amazon Prime members faster shipping. Comment below or email me with any questions; I’ve been using it for at least five years. 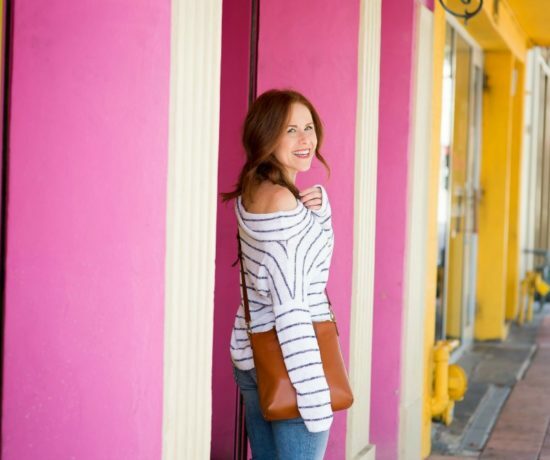 If you’re looking to make one, budget friendly purchase to update your wardrobe for spring, I highly suggest a clutch or cross-body by Mar Y Sol, regular price from $35-$48… the fun colors (or a gorgeous neutral!) and crocheted raffia will instantly add a spring feel to anything in your closet… at 20% off, it’s a great purchase. Cute picks dear. Love the simplicity and cuteness of the white laced top. And that one-shoulder laced orange blouse is just so perfect for the season! I just love blue and white pinstriped blouses and have found them all over including Talbots, TJMaxx, Macy’s and Target!!! I’m just drawn to them especially w bell sleeves or sleeve ties!! Also going for anything white!!!! Tanks , crisp cotton blouses or pants, shorts , capris and denim skirts!!!! Loving your picks – that lace one-shoulder top is on its way to me!